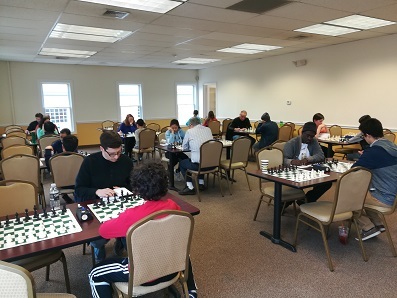 Our Sunday G/30 Quads continued to grow this week with 18 players in four sections. The top quad was won by Jack Klein. Klein scored an impressive 3/3 to win the section by a full point and a half and a nice rating gain to push him over 1800.The surprise winner of the second quad was the fourth seeded Emmanuel Hernandez! Hernandez gave up only a half point in round two to finish ahead of all of his significantly higher rated opponents. Quad three saw tie between John Moon and Becka Kvirikadze with 2/3 each. After two rounds it was Moon that was in the clear lead, but a loss to Kvirikadze allowed the latter player to catch up in the final round.The last section of the day was a six player swiss. Most of the players were rated very evenly making the final result unpredictable. After the dust settled it was Caleb Freiman who was still standing with a perfect 3/3 score! Tied just behind were Alan Wang and Noam Benson-Tilsen with 2/3 each. Congratulations to all of today's winners and thank you to all that came out to play!